Jerome Caja was born in Cleveland into a Catholic family of 11 boys. He majored in studio art at Cleveland State and earned a master's degree in ceramics at the San Francisco Art Institute. 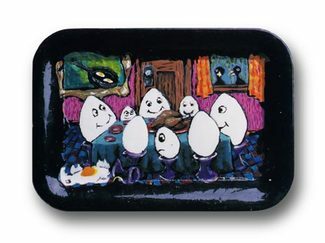 This humble, self-possessed artist painted exquisite miniatures with everything that you would find in a drag queen's handbag: nail polish, glitter, make-up, lipstick, and eye liner. His canvases included pistachio shells, lockets, discarded bottle caps, and small scraps of paper. Jerome's iconography pays homage to a wide cast of saints and sinners: Jesus, the Virgin Mary, Saint Lucy, Satan, imps, priests, cherubs, demented clowns, cannibalistic birds, pigs, and gay icons. Jerome died at the height of the AIDS-Art-Activism era in San Francisco from complications related to HIV. His papers are housed in the Smithsonian Archives of American Art, and his work is collected in major museums around the country. The Jerome Project is a multi-platform art history project to preserve, protect, and further the artistic legacy of the late Jerome Caja (1958-1995). The goal is to bring greater visibility and accessibility to Jerome’s paintings and performances. The film "JEROME and the Art of Sainthood" is the driving force for all these projects. We welcome and encourage your contributions. Nayland Blake and Justin Vivian Bond introduce us to the art and life of the extraordinary Jerome Caja (1958–1995), an artist and provocateur who transgressed the supposed boundaries of gender, performance, and art in the nightclub scene in San Francisco during the late 1980s and early 1990s. Caja’s outsize personality was matched by his powerful visual art, made with nontraditional materials like nail polish and human ashes, which details with humor, pathos, and deep insight the struggles of living with AIDS, finding love, and surviving. With additional contributions by Anthony Cianciolo, Craig Corpora, Anna van der Meulen, Amy Scholder, and Chris E. Vargas. Currently we are collecting extensive oral interviews from key individuals in his life -- friends and family, as well as community members, artists, and art critics. If you would like to participate, please ﻿﻿contact u﻿s﻿﻿. Big thanks to the Bay Area Video Coalition (BAVC) for awarding ﻿﻿The Jerome Project﻿﻿ the Preservation Access Program grant! Thank you Scott England, Matt Flynn, Stevyn Polk, David Faulk, Michael Johnstone, Chuck Mobly, Adam Klein, and The Jerome Caja Estate for entrusting me with your video. BAVC you rock! You kickstarted my production by digitizing 100+ hours of video (16 terabytes of data). I also want to give a very special shout out to the National Endowment for the Arts (NEA) for funding this grant. 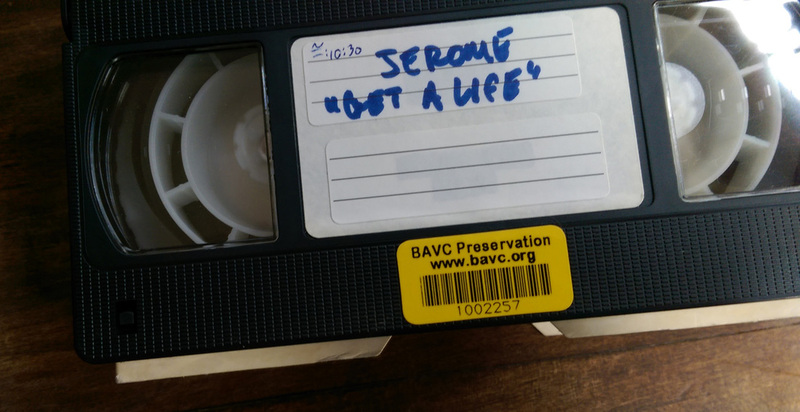 Lastly, if anybody out there has any video on Jerome Caja, please contact us and let's talk about digitizing it. San Francisco Film Society (SFFS) fiscal sponsorship. SFFS Filmmaker360 FilmHouse residency (one-year free private office space). SFFS Filmmaker360 FilmHouse alumni anchor tenant (six-month below-market rate office space). Bay Area Video Coalition (BAVC) MediaMaker Fellowship (one-year film development program). BAVC Preservation Access Grant (analog-to-digital video preservation transfers at a heavily discounted rate). Four long-term professional interns (SFAI graduate, SFFS assistant film editor, SF State animator, and Belgian art historian). The Jerome Project is particularly grateful to the National Endowment for the Arts for its continued support. The NEA has generously funded BAVC's MediaMaker Fellowship and Preservation Access programs. We have benefited greatly from both! ﻿If you are interested in receiving updates on what is happening with Jerome and his art, please sign up for The Jerome Project Newsletter by filling out our contact form. Top Banner: On the left is Anna van der Meulen's photo of Jerome from the "Hey Honey" series c. February 1983. On the right is Caravaggio's "Saint Jerome in His Study" c. 1606.